NEW YORK, NY (January 30, 2017) — Following the announcement by President Trump that Dr. David J. Shulkin was his nominee to lead the Department of Veterans Affairs (VA), Iraq and Afghanistan Veterans of America (IAVA) polled its worldwide membership to gauge opinions of the choice and to assess what is most important to Post-9/11 veterans and their families in a VA Secretary. 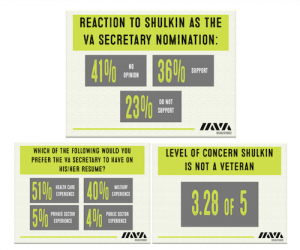 The IAVA poll findings also showed many had concern over Dr. Shulkin not being a veteran himself. More than half of the respondents expressed concern. However, having experience in healthcare is the top credential that IAVA members felt a VA Secretary should have on their resume (51%). The poll had 2,019 respondents over a 24-hour period. The self-reported makeup of the total sample was: 71% percent veterans, 19% percent military family, and 10% percent non-veteran supporters. Heading into Dr. Shulkin’s confirmation hearing before the Senate Veterans Affairs Committee this week, IAVA will continue to ensure our members’ voices are heard. Starting today, we are asking our members to submit questions they would pose to the next VA Secretary before supporting his confirmation. Questions from the IAVA community will then be previewed on iava.org and subsequently shared with Congress and the media ahead Shulkin’s this Wednesday, February 1st.